A cluttered space brings a cluttered mind. All those papers in your desk, backpack, car or workplace take a psychological toll. Just trying to focus with all that distraction is like trying to do a pushup while someone is sitting on your back. Fortunately, paper clutter doesn’t have to be a burden. Most people carry around always-on cameras, connected to infinite cloud storage. Shrink all those distractions down with a cellphone camera, store them remotely and access them anytime, from anywhere. That’s the promise of an app called CamScanner. It’s a free download on the iTunes App Store and the Google Marketplace, and it does exactly what it claims to do. It turns your phone’s camera into a scanner. You can take high-resolution scans of receipts, letters and other important documents, and then store them using the app’s built-in cloud storage. For later recall, you can give each image a title and a tag, creating searchable clusters of important documents. You can share storage on the cloud with others, enabling you to make your documents accessible to a spouse or business partner. You can also export images as PDF files and share them through email or another cloud storage app, such as Google Drive. The app is free and has premium upgrade options. There are some real limitations in the free version. PDF files come with a watermark, which is easy enough to ignore for personal use but may detract from professional presentation in a business setting. Also, there’s no optical character recognition (OCR), so creating digitally editable documents takes some doing. If you’re hoping to scan pages from a recipe book to later punch up in a word processor, you’re out of luck without using one of a few cumbersome workarounds. The free version also has limited cloud storage, though at 10GB it’ll take a lot of scanning before you feel the pinch. The free version contains some ads, though they’re minimally intrusive. The premium features cost $4.99 a month or $49.99 per year, and includes unlimited cloud storage, OCR capabilities and no watermark on PDFs. There’s no time limit on the free version, so you can try it as long as you like. Of course, there are other similar apps on the market. 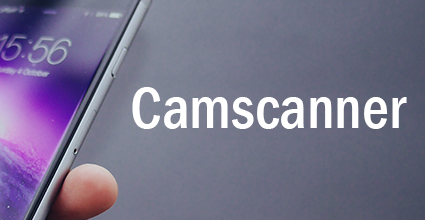 However, CamScanner offers a smooth, intuitive interface and broad compatibility. It’s a great way to get your feet wet in a paperless world without investing a lot of time, money or energy in new gadgets or programs. It works with the devices you already carry, and may decrease the clutter in your life just a little bit.